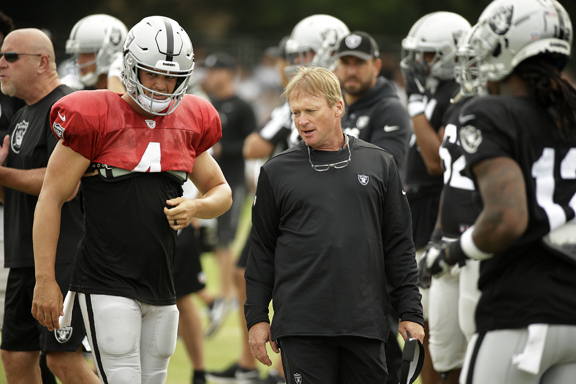 NAPA, Calif. — As much as he tries to downplay the significance, Oakland Raiders coach Jon Gruden is fully aware Friday’s exhibition game against the Detroit Lions will be anything but an ordinary preseason contest. It’s been 17 years since Gruden last roamed the sidelines at the Coliseum with the Raiders. He came back in 2004 with Tampa Bay and again in 2012 as a television analyst. Gruden’s iconic status among Raiders fans promises to make this time different. Much, much different. Gruden developed a cult-like following during his first stint as the Raiders coach from 1998-2001. Those feelings didn’t wane when Gruden was traded to Tampa Bay by late owner Al Davis and only strengthened when the coach went into the television booth. Gruden showed his appreciation in 2009 while in town to broadcast a San Francisco 49ers game when he held a party at Ricky’s, a Raiders sports bar not far from the Coliseum. Gruden held another party at Ricky’s three weeks ago to celebrate his return and paid for dinner and soft drinks for the fans. About 600 people showed up. Lions coach Matt Patricia developed a friendship with Gruden while he was defensive coordinator in New England. Gruden’s return, Patricia said, is good for the NFL. “If you meet with him, you’re gonna find a guy that absolutely loves football from its core, all the way out, every aspect of it,” Patricia said.